"My third time as a host of a game, but with a group of players who'd never tried a freeform game before (though a couple of role players). Organization was easy and we got a great location to play in… a old convent's sitting room and parlour. Everyone by the end had thrown themselves into their roles, several characters got away with what they needed rather splendidly, while others who were thwarted were keen to try again at some point soon… now they see how it worked they felt they'd have a better understanding of how to approach their goals. Everything provided was easy to use, and make it go smoothly. Couple of minor layout changes on the clue/secrets/abilities would probably help for the mechanics of the game itself, but these are minor quibbles. " "What a fun afternoon :-) We made the decision a little late to host a Murder Mystery for my birthday this year. My partner very generously agreed to host the game so that I could play. He had never participated in a Murder Mystery before and was not entirely prepared for the volume of work hosting entailed, but he took to it like a pro and set the tone from the start with his invitation. We had a mix of experienced and inexperienced participants which meant that some were tentative to speak to each other and try out their abilities and others figured out how to get ahead really quickly. This didn't matter, eventually everyone got into character and after some great twists to the tale things got particularly interesting towards the end! I highly recommend Lord and Lady Westing's Will. We used all of the characters including the bonus character. We played in the afternoon not the evening. We hosted the event at home and served a finger feast with lots of beer and wine and whisky which worked really well. Everyone had an awesome time – thanks for a great game." "I hosted Lord and Lady Westing's Will for my son's 17th birthday and it was a fabulous evening! I bought the game just 3 days before the party, and that is definitely not recommended, especially if you are the host and having a sit down dinner also. (Pizza next time, but my son thought it would be fun to gather everyone together to try to spy on each other.) It is very important to have a comfort level with the material, as there is a lot going on, so you do need time to study everything. The kids were very enthusiastic: they thrift-stored for their vintage looks, stayed in character to the end, lied and connived like champs, built alliances, and were very patient when I had to fumble through the pages of my notes. When all the item cards were out and about, it made for very spirited play. There were bodies all over the place! They are all ready for another game as soon as possible, and another parent is looking forward to trying his hand as host in a couple of months. I am so glad to have found Freeform Games. The story and characters were all very interesting and diverse and it was great fun for the guests to be the characters with their hilarious "accents," instead of following a script. Bravo Freeform and thank you! Our only problem now is which mystery to try next. " 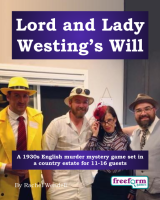 Lord and Lady Westing's Will is a dinner party murder mystery game for 11 to 16 guests and a host – download the free introductory pdf file. Join us in an impeccably suave evening of suspicion, double-dealing and murder! You will be in the middle of the action and it will be up to you to wheel and deal with the other guests. Can you achieve your goals, keep your secrets hidden and survive Lord and Lady Westing's Will? It's up to you. Lord and Lady Westing's Will is set in 1935, at Chateauhouse in Derbyshire, England: the country estate of the wealthy and influential Lord and Lady Westing. Lord and Lady Westing have died in a tragic hot-air balloon accident. You have been invited to a celebration of their life and legacy. It will be a day of celebration and gaiety (and possibly great reward!) The year is 1935 and there are rumblings of war across Europe. The Great War is still fresh in people's memory. Times are lean and Germany is looking more militant by the day. The tragic death of this charming and exciting couple only further darkens the mood of the country. But there are hints that not all is as it seems. Why did the Westings arrange this unusual party to read their will? Why did they invite crime-solvers as well as some of Europe's and America's more notorious personalities? Was their death truly an accident? – or is something more sinister in the wind? Lord and Lady Westing's Will lasts for about four hours and is suited to an evening. It is often played over a meal – a finger buffet if possible to allow guests to circulate and talk in private. The free introductory pdf file contains an introduction to the game, a cast list of all the characters, and a copy of the News Clippings – plus details of how to buy the game. Lord and Lady Westing's Will is unlike many murder mystery games. Although the game starts with a murder, some of the characters have more important things to do than to investigate it. And the killing may not be over – it's not certain that everyone will survive the remainder of the evening! Lord and Lady Westing's Will is played just like a murder mystery game. You may be trying to solve the murder, but primarily you are (initially at least) concentrating on your own goals and objectives. Unlike most boxed murder mystery games, Lord and Lady Westing's Will lets you decide how to achieve your goals and thwart your enemies. On the evening of the game the guests are met by the organizer, the Westings' butler/housekeeper, and welcomed to Chateauhouse. They then receive their detailed backgrounds – including dark secrets, objectives and money. The fun then begins as they form alliances, blackmail each other, steal items and maybe even try to attack one another! Depending on what the players choose to do, there are several different possible endings, but finally everyone finds out how they did, and what secrets everyone else was concealing. Lord and Lady Westing's Will costs £20.00 (GB pounds) or US $29.99. You can buy it in either currency, from anywhere in the world, as you prefer. The price will be converted back into your own currency for you, at today's exchange rate. We offer a Cast Iron Guarantee on all our murder mystery games. If you're not completely satisfied with Lord and Lady Westing's Will then please let us know within 30 days and we will refund you. See our full terms and conditions here.